Scientists believe they have achieved the first accurate estimate of how much faster Earth's core is rotating compared to the rest of the planet. University of Cambridge study has discovered that earlier estimates of one degree quicker each year were wrong. The core is actually moving much slower than previously believed - approximately one degree faster every million years. Material from the fluid outer core solidifies onto its surface, making Earth's inner core grows very slowly over time. During this process, an east-west hemispherical difference in velocity is frozen into the structure of the inner core. Scientists used seismic body waves which pass through the inner core - 5 200km beneath the surface of the Earth - and compared their travel time to waves which reflect from the inner core surface. The difference between the travel times of these waves provided them with the velocity structure of the uppermost 90 km of the inner core. Because the inner core grows over time the deeper structure is therefore older. 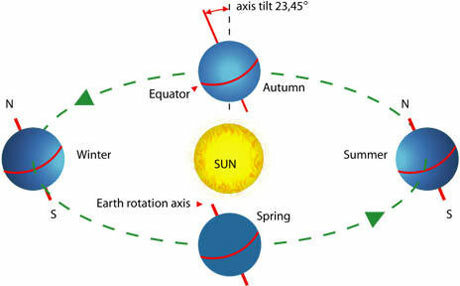 The shift in the boundaries between the two hemispheres results in the inner core rotating with time. As the inner core grows, the heat released during solidification drives convection in the fluid in the outer core. This result is the first observation of such a slow inner core rotation rate. This convection generates the Earth's geomagnetic field which protects our planet from solar radiation. The scientists' findings are published in the journal Nature Geoscience. Science's most pressing concern must be - When will the pole reversal of earth occur?